When litter box accidents are happening more frequently, then you know you’ve got a problem on your hands. Cleaning your furniture from your pet cat’s pee and poo aren’t exactly how you’d want to spend the evening after a full day at work. And throwing away carpets or rugs that you’ve had for years isn’t exactly how you want to waste your hard earned money. While disposable diapers can be a solution for your beloved feline, they can be expensive in the long run and quite frankly, they make your cat extremely uncomfortable. The solution to your cat’s incontinence and your desired peace of mind just might be fabric diapers. But not just any ordinary cat diaper, but only the best for your pet: Joybies Piddle Pants for small cats. Joybies is one of the most trusted and recognized names in premium pet apparel, and have been manufacturing pants for cats for the past decade. 1 What is Joybies Piddle Pants? What is Joybies Piddle Pants? Joybies Piddle Pants are available for both dogs and cats. While there are gender-specific pants for dogs, they’re unisex for cats. They look like cute, little overalls that your cat wears, and there’s a hole on the tail. The fabric is made of a stretchable, waterproof material so it doesn’t soak and your cat stays comfortable. Piddle Pads come in 30 pieces when you buy a pack and you insert one each time your cat wears the pants. The pants are machine-washable and line-dried so you can use them for as long as you and your cat likes. They’re more expensive initially compared to disposable diapers but in the long run, they’re a more economical choice. What’s so good about these pants is that they fit snugly, they’re easy to attach and remove, but made in such a way that your cat can’t take them off themselves. So what you’ve got is a simple, inexpensive solution to your cat’s problems, who may be suffering from arthritis, or they’re already in their senior years, or recovering from an injury. They’re comfortable and can stay on your cat for hours. Lining pads keep the Piddle Pants clean and reusable. They’re easy to clean – just throw them in the washing machine and that’s it. There’s a hole placed where your cats can poo. But if you want the pants to hold the poo, the pants can still do so. Simple placement of the Piddle Pants is all it takes. Measurement only involves measuring the length from the collar to the tail, which doesn’t consider the width of your cat. Some pet owners have complained that sizes are sometimes too big or too small for their pet. Most cats find the pants uncomfortable to begin with, so it might take your cat some time to get used to wearing them. The Piddle Pants are great for pet owners who don’t have the time or the energy to clean after their cat who may have incontinence problems. Elderly cats can suffer from incontinence, as well as those who are recovering from an injury or illness, or young kittens that still need to be trained. Behavior problems like your cat acting out can also be solved with the Piddle Pants. The product is not for anyone who doesn’t use a washing machine. If you don’t have one or don’t use it, then you’ll find the Piddle Pants a tad bothersome since you’d have to frequently wash them to keep them clean and sanitized. If your furniture, your carpet, your home, or family relationships are suffering because of too frequent litter box accidents, then it’s time you find a solution to keep your cat from marking, spraying, or accidentally peeing or pooping in your home. Joybies Piddle Pants are award-winning, and have been in the industry for many years, which are testaments to how successful and efficient these pants are. 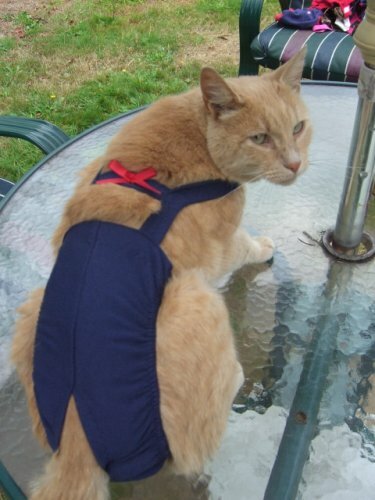 Finally have your peace of mind and keep your pet cat comfortable with Joybies Piddle Pants. You can have a look at our guide for Treating the Cat Incontinence.